Rider First Aid – created by road safety charity Brake, British Red Cross and Devitt Insurance Services – gives basic advice on what to do when first on the scene of a crash involving a motorcycle. Road Safety Week 2018 (19–25 Nov) aims to improve the safety of cyclists and motorcyclists under the theme ‘Bike Smart’. The toolkit is aimed at riders but gives useful advice for anyone who could be first on the scene of a crash. It includes free posters and postcards, and an interactive quiz to test first aid knowledge. The advice focuses on four key areas of first aid, reflecting the most common injuries sustained by motorcycle riders: broken limbs, heavy bleeding, unresponsive and breathing, and unresponsive and not breathing. 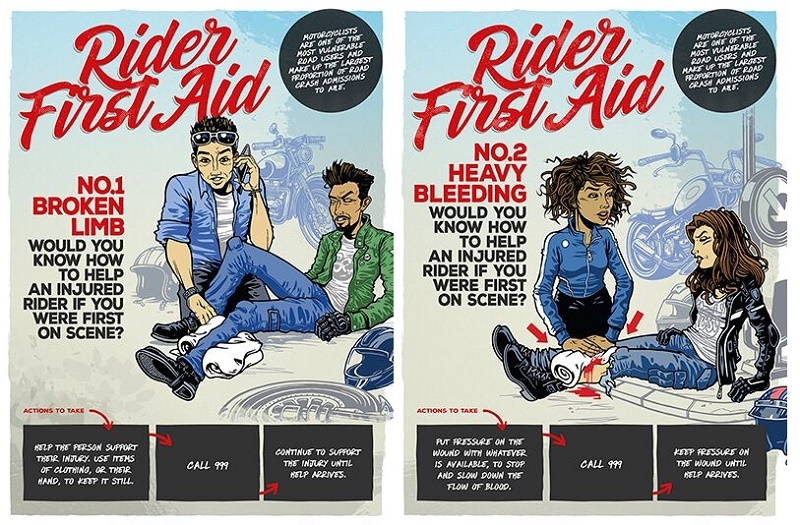 The posters show riders helping one another, with the question ‘Would you know how to help an injured rider if you were first on scene?’. 5,941 motorcyclists were killed or seriously injured on British roads in 2017 – the equivalent of 16 riders every day. Dave Nichols, community engagement manager at Brake, said: “Motorcyclists are disproportionately involved in crashes and the resulting injuries are often severe. “Riders do not have the same protection as other vehicle users in the event of a crash, exposing them to the full force of impact. Joe Mulligan, head of first aid at the British Red Cross said: “When someone has been seriously injured in a motorcycle or a road traffic collision it’s vital that the injured person receives help straight away.